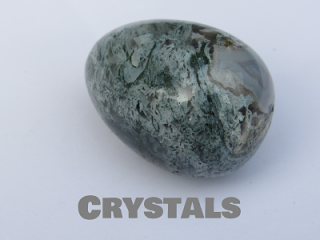 You will find most of our crystal products here in this category. Our Crystal Collection is a broad range of crystal packs containing individual crystals and with a description of their features on the back including Chakra Alignment, Birthstone Allegiance as well as Chemical Composition, Origin and any Esoteric features of the stone. We are hoping to expand this range in the following year to give your more choice as we know some of you often seek a particular stone for your collection. If you are looking for stones that have been cut into a special shape then this is where you should look. Green leaf Agate Gem Tree with approximately 100 green Agate leaves. Brown trunk with gold.. Grounds and protects, while gathering and consolidating scattered energy. Can be used to cleanse ..
A perfect size for being held, with an indentation for your thumb. Can also be used as a Worry Stone..
We will send you a random clear or coloured genuine agate crystal tumble stone. If you have a partic..
Also know as Worry Stones - Palmstones are smooth surfaced and give a gentle energy that feels ..
A powerful healer and cleanser having the ability to absorb pain and negative energy. It is good for..
A tiny powerhouse of energy.Energises and centres all Chakra, particularly the Solar Plexus and abov..
Amethyst Dragon Half-Egg - Quartz pebbles cut in half with a polished window showing a brilliant shi..
Used to treat stress and confusion. Helps to find a clear and decisive solution to problems. G.. Highly protective, connects with the past-life and aids deep meditation. Particularly useful for .. The most spiritual of all calcites. Particularly useful for spiritual development and all work wi..
Mood-lifting, promotes spiritual growth and clairvoyance. Good for hormone balance and vision on ..